The award-winning grand piano sound in Privia has been dramatically improved. 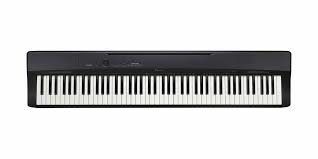 The PX-160 utilizes more than three times the memory of the previous generation for a more natural piano tone. In addition, Casio’s new proprietary sound source “AiR” (Acoustic and intelligent Resonator) provides unmatched realism and detail. This engine provides seamless dynamics for a remarkably expressive and powerful performance. For further realism a new Damper Resonance simulator provides the rich sound of the strings when the sustain pedal is used.